Why do you need to Remove Weeds? Weeds are just your regular growing plants. The difference is that these plants are undesirable and unwanted. Weeds tend to grow in wrong place and at the wrong time. This is why most gardeners remove them because they are a nuisance to the other plants. Weeds compete with your crops and other plants for nutrients and space. If left unanswered, the weeds will overrun your garden and it will kill your crops. The weeds will take away the healthy soil and what remains with your plants is stale soil. Weeds can grow in different environments and different conditions. This is why you’ll have to remove them or else your crops will suffer. Weeds grow by type, and depending on its type different methods can be used to eliminate them. Weeds are dangerous to your plants. Needless to say, if you’re a gardener this might be a good reason for you to remove them. Weeds are very invasive and they will suffocate your crops by taking its soil. If you value your crops then you might want to remove them as soon as possible. Leaving weeds as they are will have a huge impact on your garden. They can grow quickly and rapidly if they grow on healthy soil. And if you’re growing crops, you’ll need to double time getting them removed. Be wary of the negative effects of garden weeds. Another reason to remove weeds from your garden is that it could strangle your plants. You’ve read that right, strangle. Weeds can grow under and over your plants, grip them, and stop them from growing. This will affect the growth of your crops and plants in your garden. Putting up a weed barrier might not be enough to stop weeds from invading your plants. That’s why removing them might be the best solution for your garden. Now that you understand the importance of removing weeds from your garden. It’s time to know how to get rid of weeds in the garden. There are many ways on how you can achieve this goal, the entries on this list are fairly easy. One of the simplest ways of getting rid of weeds in the garden is by pouring boiling water. You might not believe it but this method actually works. It destroys the natural process within the weeds and kills it slowly. It also withers the leaves of the weed which stops its growth process. The first step that you need to do for this project is to boil hot water in a pan or kettle. We prefer to use the kettle so that you wouldn’t need to transfer it to another container. The water needs to be at a boiling point to work because warm water is not enough. Next is to find your target weed to eliminate. Make sure that your crops are away from the weeds because you don’t want your crops to suffer the same fate. 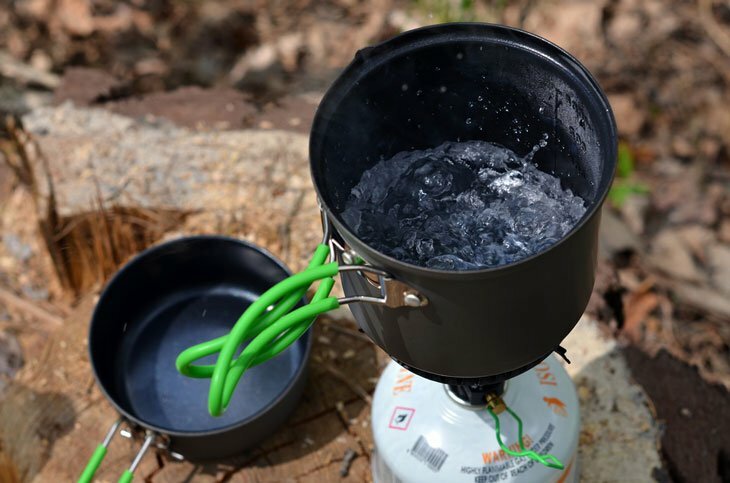 Using a kettle will increase your accuracy while pouring the hot water. After pouring the hot water on the weeds wait for it to die out before you pluck it out. It will be much easier if you just use your gardening gloves to pull it out. After pulling it out place it inside of the garbage bag and you’re done! One of the easiest ways of eliminating weed is by using weed herbicide. There are a lot of weed herbicide that’s being sold in the market today. It can kill any sort of weed quickly and effectively but the downside to this method is that it's toxic. Depending on what kind of herbicide that you’ll use. You will need to follow the instructions on how to use the herbicide first. 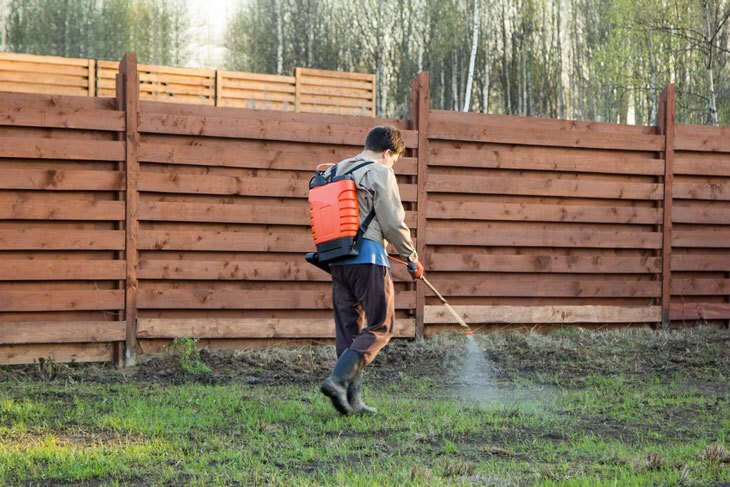 Mix the solution properly before you start spraying it on your weeds. Make sure that the area is clear before spraying. Equip your gloves and find a patch of weed to kill. Remember what you’re spraying is toxic, just place a little amount on the weed. This chemical is toxic to plants and animals so be mindful. The next step is to wait for it to take effect. Wait for the weeds to die out, it will take a few hours to a few days to take effect. When the weed finally dies out, dig it out with your hand shovel. You might want to use your hoe if the soil is hard enough for the shovel to penetrate. After you get the top part of the weed, it’s time to pull out the bottom roots. Chop it off with the hand shovel or garden hoe. Finally, dispose of it by throwing it inside of the garbage bag together with the leaves. 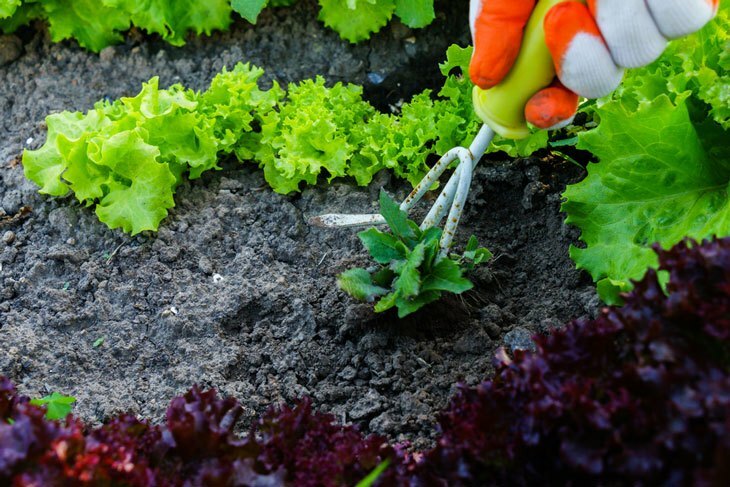 One method that you can try without using any gardening tools is the manual pulling method. Manual pulling might seem tiring at first but when you get the hang of it there would be no problem. Plucking weeds are the fastest way of eliminating small patches of weeds. Wear the gardening gloves and prepare the bucket of water by your side. Pour the bucket of water over the designated weeds and wait for the water to settle. This will allow you to pull out the weeds faster because the soil is loose. Grip the base of the garden weed and pull it straight up. Make sure that the roots are also uprooted because they can still grow to new weed if not taken out. Gather them all in one spot before placing it inside of the garbage bag. 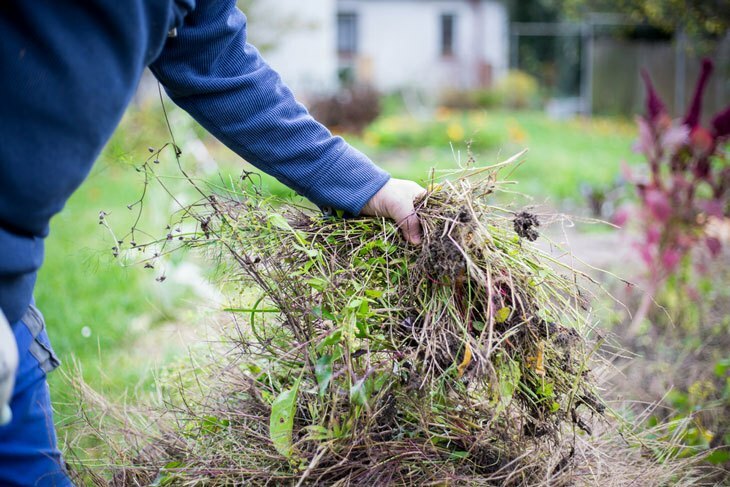 Place the garden weeds inside of your garbage bag. If you don’t have any garbage bag you could always burn the weeds together with your firewood. Weeds make excellent fuel especially if they’re dried and dead. Weeds are easy to get rid of if you just have the right mindset to do the job. Garden weeds need to be dealt with as soon as possible. This is because if you don’t, it will spread on your garden like wildfire. So be the best homeowner and gardener by removing the weeds in your garden. So did you like this simple guide? If you do, please like and share this article with your fellow homeowners. 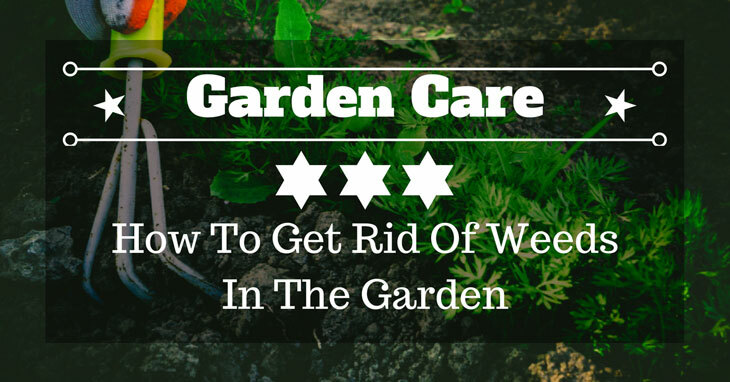 These are just some ways on how you can get rid of weeds in your garden. Comment below on what you think about the article. Thank you for reading!